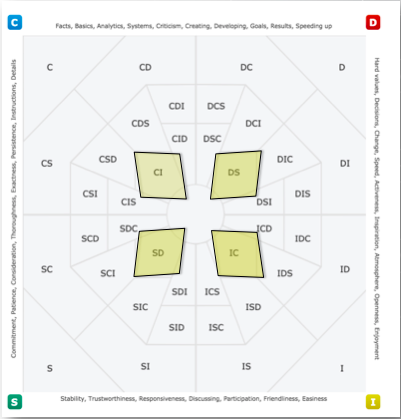 The Opposite Extended DISC Profiles identify people who are a combination of the DISC styles that tend to be the most behaviorally different from one another. These opposite DISC styles are the furthest distance from one another on the Extended DISC® Diamond. They are a combination of two styles. The Opposite Profiles are "DS," "SD," "IC," and "CI." In the Extended DISC Diamond example above you can see the location of the four Opposite Profiles. They are closest to the center ring. If you are 100% of a DISC style you are located in the extreme corners of the Diamond. These 100% styles only account for 1% of all profiles. 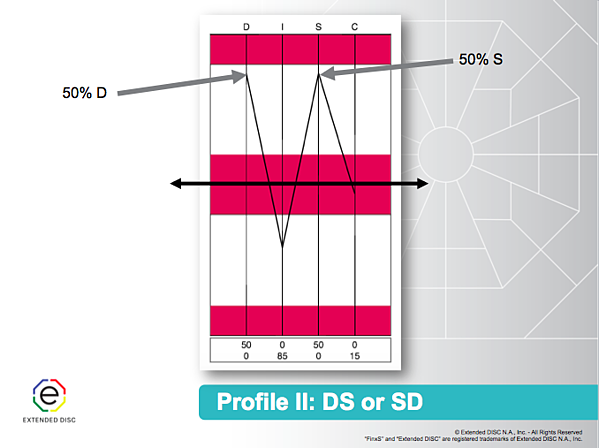 Two DISC styles, other than the Opposites, are located in the outer ring and account for 31% of all profiles. 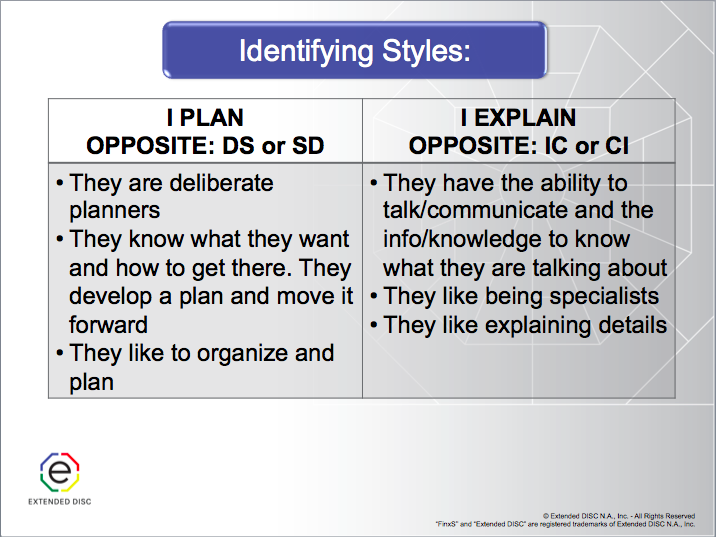 The D-style and S-style tend to exhibit behaviors that are more polar opposite. For example, D-styles tend to be more aggressive, decisive, and individualistic. They prefer to focus on tasks, things and accomplishments. On the other hand, S-styles are easygoing and considered the "team players" of the DISC styles. They prefer to focus on people and feelings over tasks and things. They can be seen as indecisive because they want to make the best decision for the people around them and they want consensus before making a decision. The I-style and C-style tend to exhibit behaviors that are more polar opposite. I-styles are the most talkative of the four DISC styles. They prefer to focus more on interactions and emotions whereas, the C-style is usually more reserved and prefers to work alone. I-styles are less focused on data and details and prefer to work in environments having a lot of variety. C-styles prefer to work in environments that are more structured and proven. They are often frustrated by uncertainty and chaos. Every one of us has all four of the DISC styles. 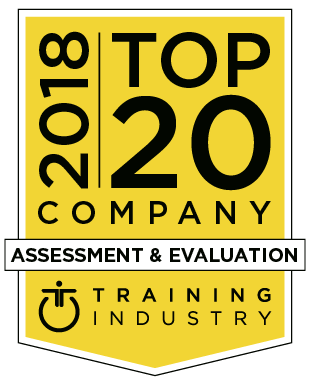 The Extended DISC Assessment identifies the ones that are natural or most comfortable to us and the ones that are not natural or take more energy for us. We usually only focus on identifying a person's main DISC style. 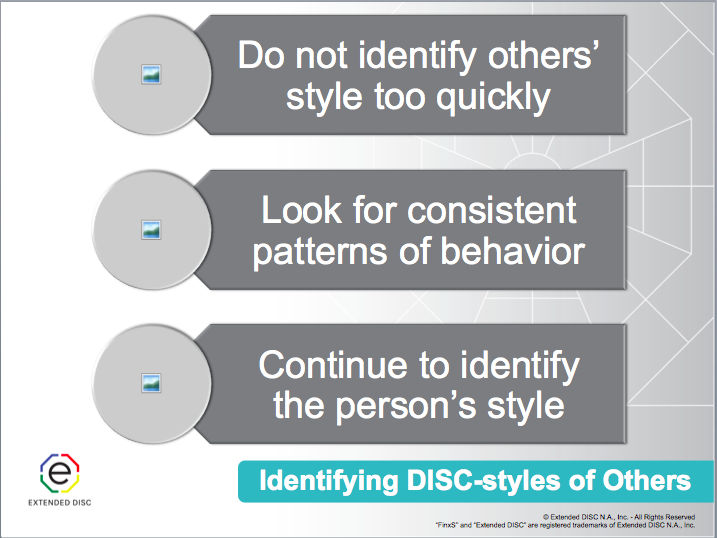 However, to truly understand a person's behavioral style, we need to look at their relationship of all four DISC styles. "I Plan" profiles are individuals with a combination of D-style and S-style. We call them deliberate planners because they see their goals, but they also want to understand how to get there. They know what they want, develop a plan and move toward it. Sometimes, they can be less decisive on timetable; how quickly or slowly to get there. They are very organized and persistent because results are very important to them. The "I Explain" Profiles are individuals with a combination of I-style and C-style. 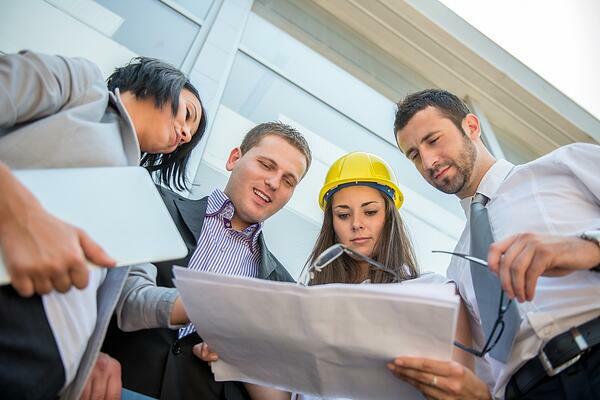 IC Profiles are typically very talkative, but they like to talk about details and things. The I-style part of them likes to chat and the C-style part of them has taken the time to know what they are talking about. This style is commonly found in specialists who like explaining details. They tend to be verbally passionate and animated when they are focused in on their topics of interests. How do we identify people with Opposite Profiles? The first thing is to remember not to identify others too quickly. We want to be as confident as possible about the person's style so we can effectively interact with them. Identifying someone's style should be never-ending; we should continue to gather and reassess the information about the person's patterns of behaviors.